1. What are the main operation divisions of a manufacturing company? 2. What are the main functions of each operation division? A variety of operations keep businesses, especially large corporations, running efficiently and effectively. Common business operation divisions include (1) production, (2) marketing, (3) finance, and (4) human resource management. Production includes those activities involved in conceptualizing, designing, and creating products and services. In recent years there have been dramatic changes in the way goods are produced. Today, computers help monitor, control, and even perform work. Flexible, high-tech machines can do in minutes what it used to take people hours to accomplish. Another important development has been the trend toward just-in-time inventory. The word inventory refers to the amount of goods a business keeps available for wholesale or retail. In just-in-time inventory, the firm stocks only what it needs for the next day or two. Many businesses rely on fast, global computer communications to allow them to respond quickly to changes in consumer demand. Inventories are thus minimized and businesses can invest more in product research, development, and marketing. Marketing is the process of identifying the goods and services that consumers need and want and providing those goods and services at the right price, place, and time. Businesses develop marketing strategies by conducting research to determine what products and services potential customers think they would like to be able to purchase. Firms also promote their products and services through such techniques as advertising and personalized sales, which serve to inform potential customers and motivate them to purchase. Firms that market products for which there are always some demand, such as foods and household goods, often advertise if they face competition from other firms marketing similar products. Such products rarely need to be sold face-to-face. On the other hand, firms that market products and services that buyers will want to see, use, or better understand before buying, often rely on personalized sales. Expensive and durable goods — such as automobiles, electronics, or furniture — benefit from personalized sales, as do legal services such as the provision of insurance policies or tax preparation. Finance involves the management of money. All businesses must have enough capital on hand to pay their bills, and for-profit businesses seek extra capital to expand their operations. In some cases, they raise long-term capital by selling ownership in the company. Other common financial activities include granting, monitoring, and collecting on credit or loans and ensuring that customers pay bills on time. The financial division of any business must also establish a good working relationship with a bank. This is particularly important when a business wants to obtain a loan. Businesses rely on effective human resource management (HRM) to ensure that they hire and keep good employees, and that they are able to respond to conflicts between workers and management. HRM specialists initially determine the number and type of employees that a business will need over its first few years of operation. They are then responsible for recruiting new employees to replace those who leave and for filling newly created positions. A business’s HRM division also trains or arranges for the training of its staff to encourage worker productivity, efficiency, and satisfaction, and to promote the overall success of the business. Finally, human resource managers create workers’ compensation plans and benefit packages for employees. Activity 1. Structure and Hierarchy in a Company. Read the passage about the typical structure and hierarchy in a company and answer the questions which follow. The highest executive body in a company is the Executive Board (or the Board of Directors). It is accountable to stockholders, and the Board reports to them at the annual stockholders' meetings. The President of the company (Chairperson in Britain) usually makes the report. The President is the nominal head of the company and is elected at the annual stockholders' meeting. But the President does not supervise the day-to-day running of the company. That is the duty of the Senior Vice-President, or Chief Executive Officer (called a Managing Director in Britain). He or she has the real executive power, though the President presides in the Executive Board. The other members of this board are also vice-presidents (or directors in Britain). They will usually include a Vice-President for Production (British: Production Director), a Vice-President for Marketing (British: Marketing Director), a Vice-President for Finance and Administration (British: Financial Director), and often a Vice-President for Shipping (Transportation). Every Vice-President is responsible for the operation of one or more departments. Executive departments may vary, depending on the company and its activity, but some that are found most frequently are Production, Marketing, Finance, Personnel (Human Resources), and Research and Development (R&D). The Personnel Department is usually under the supervision of the Vice-President for Finance and Administration, while the R & D Department is under the Vice-President for Production. Department heads are called directors or managers, and they are supervised by vice-presidents. Departments, in their turn, may be subdivided into sections or sectors. For instance, the Marketing Department may have a Market Research Sector, a Sales Sector, and an Advertising and Promotions Sector. The Finance Department may be divided into Financial Management Sector and Accounting Sector, with the Chief Accountant at the head of the latter. In some companies sectors may form separate Departments with separate directors or managers. There are some peculiar positions in a company's hierarchy. One of them is a Public Relations Manager who either belongs to the Marketing Department or heads a special sector. His or her responsibilities are to create and maintain the best possible image for the company in the eyes of the public. A big company may also have divisions. This happens when the goods (commodities) produced by the company are quite different. For instance, an automobile company may have a truck division and a car division, each with its own department for production, marketing, or other tasks. Many companies, especially multinational corporations, are also divided geographically. There are special departments, managers, directors, or even vice-presidents responsible for operations in certain geographical territories, countries, or continents. Geographical division facilitates management and allows taking local peculiarities into account. In American corporations, departments responsible for operations outside the USA report to the Vice-President for International Operations or to some other Vice-President. In Britain, regional departments are accountable either directly to the Managing Director or to the head of the Sales Department. Finally, corporations often have subsidiaries (affiliates) that are more or less autonomous. An affiliate is another company owned by a parent company. An affiliate, or subsidiary, appears when a company becomes the owner (proprietor) of more than 50% of its capital. As you see, the structure and hierarchy of a company is quite complicated. This is true in large partnerships as well. The structure and hierarchy is called ‘the chain of command’ and ensures the company’s efficient functioning. 1. Who is the nominal head of a company? Where and to whom does he/she report? Does he/she supervise the day-to-day running of the company? Is he/she elected or appointed? 2. Who has the real executive power in a company? 3. What is the biggest executive body in a company? Who are the members of this body? What are their titles (in the USA and Great Britain)? 4. What is each Vice-President responsible for? What departments do they supervise? 5. What is a division? Can division have separate departments? 6. Why is the geographical division of big companies necessary? Who supervises the work of such departments? 7. What is a subsidiary or affiliate? 8. What is the ‘chain of command’? White's Shandwick International wrote a series of 10 articles about western business success stories in Ukraine. Here is the story of Coca Cola published in Volume 4/2002 in the magazineThe Ukrainian. According to the BBC the two most recognisable symbols in the world today relate not to the great religions but to a rather famous brown fizzy drink and a humble hamburger. The red can is now recognised by more people around the world than any other symbol. The shape of the bottle is recognised second only to the egg and the spoken name is the world's most recognised word after 'OK'. Such is the power of advertising ... or is it? There comes a point where a brand develops a life of its own and the associations surrounding the brand become more than the product itself. Never has this been truer than with Coca-Cola. 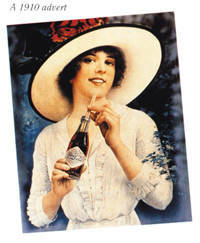 Launched in 1886 Coca-Cola became one of the earliest examples of a national brand in the USA. Following the liberation of Europe and South East Asia in 1945 it was American cigarettes, nylon stockings and Coca-Cola that became the currency of freedom. Collecting the empties became a source of income and new companies were born on the proceeds. Is it little wonder then, that this humble soft drink originally sent over to remind American soldiers of home has become such a worldwide symbol of freedom in more than 200 countries with over 225,000,000 litres being drunk every day. When Coca-Cola appeared in Moscow just after the fall of the Berlin Wall sales rocketed as the red can became an affordable icon of change. It became the gift; no self respecting male would offer his girlfriend flowers if the magic red can was available. Sales rose from nothing to 44% of market share in 6 months and all because it epitomised the yearning for freedom. Coca-Cola arrived here officially in 1992 just after independence; the company was one of the first sizable foreign investors in Ukraine. By 1998 Coca-Cola in conjunction with the Hellenic Bottling Company had built one of the largest bottling plants in Europe and today has invested over $280 million. Over 80 % of all the raw materials used are sourced in Ukraine. Even the water comes from 390m below the factory in the lime stone rocks of the Jurassic period. Cynics would say ''Ah but the local product is not as good as the original''... they would be wrong as product quality is always well within the 2 % tolerance set down by Coca-Cola production standards. Coca-Cola in Ukraine employ over 1000 people directly, only three of which are non-Ukrainian. Such is the nature of the product that for every job directly created a further 12 people are employed as collateral benefit. Today Coca-Cola is sold through over 50,000 outlets including just about every supermarket, gastronome, bazaar and kiosk in the country. As in the rest of the world Coca-Cola is now Ukraine's favourite non alcoholic drink. In the 20th Century no single product has evolved to become such a symbol of freedom and enjoyment. No single brand has become more directly associated with the aspirations of the young and no product has done more to enhance the values of freedom of choice, thought and action than the humble bottle of brown fizzy liquid we have all come to enjoy. Exercise 1. Match the words from the text (1-10)with their definitions (a-j). Exercise 2. Complete the passage using words from Exercise 1 in the correct form. Coca Cola has operated outside the US since 1897, at first with only marginal competition from Pepsi, and in the process it has become the world’s best-known 1_____. Today Coke outsells Pepsi around 3 to 1 outside the US. 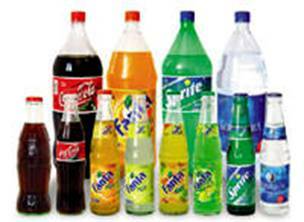 The domestic race is closer, with a 41%-32% ratio in Coca-Cola’s favour. In part, Coca-Cola can thank the US government for its success abroad as During WWII; the USA military built more than 60 Coke bottling plants outside the US to supply American troops. This gave the company leg up in Europe and Asia when the conflict was over. Pepsi got its international marketing break in 1959 when then chairman Donald Kendall handed Soviet President Nikita Kruschev a bottle of this 2_____ drink as the cameras clicked: that gave the company an entrée into Eastern Europe. Since the collapse of the Berlin Wall, Coca-Cola has moved swiftly to overcome Pepsi’s 3_____ in Eastern Europe. Pepsi’s strongest recent showing has been in Mexico where the company reports its 4_____ has jumped from 28% to 33% during the past two years. Who’s going to get 5_____ from this battle? People the world over will probably drink more of the beverages, as more 6_____ are being built and the products of these two companies are becoming more available. The average American nowadays drinks more soft drinks than water. Non-Americans have a long way to go before they reach that level – and that gives the two giants 7_____ for booming business in the nearest future. 1. What is the typical structure and hierarchy in a company? 2. What is a ‘company profile’? 3. What information should be included in a company profile? Company profile is a brief outline/short description of a company. Company profile gives such information about a company as name of company, headquarters, chairman, business activities, main markets, sales/turnover, number of employees. The MoDo Group is an international company. Its headquarters are in Stockholm. The President and Chief Executive Officer is Bernt Lof. Its main areas of business are fine paper and other wood products. Most of MoDo’s production is carried out in Sweden, but the company is present in many European countries and in the United States. More than 80% of the Group’s total sales of $8.4 million in 2004 came from countries outside Sweden, primarily the European Community. The company has about 12,961 employees. Before reading the article about Philips, decide whether these statements are true or false. 1. It is the world’s second biggest electronics company. 2. It has produced over 1000 million TV sets. 3. Its headquarters are in Amsterdam. 4. It was the first company to produce compact discs. 5. It is active in a small number of specialized businesses. 6. It provides the lights for famous landmarks such as London’s Tower bridge. Read the article and check your answers. The foundations of the world’s biggest electronics company were laid in 1891 when Gerald Philips established a company in Eindhoven, the Netherlands, to manufacture light bulbs and other electrical products. In the beginning, it concentrated on making carbon-filament lamps and by the turn of the century was one of the largest producers in Europe. Developments in new lighting technologies fuelled a steady programme of expansion and, in 1914, it established a research laboratory to stimulate product innovation. In the 1920s, Philips decided to protect its innovations in X-ray radiation and radio reception with patents. This marked the beginning of the diversification of its product range. Since then, Philips has continued to develop new and exciting product ideas like the compact disc, which it launched in 1983. Other interesting landmarks include the production of Philips’ 100-million TV set in 1984 and 250-million Philishave electric shaver in 1989. Philips’ headquarters are still in Eindhoven. It employs 256,400 people all over the world, and has sales and service outlets in 150 countries. Research laboratories are located in six countries, staffed by some 3,000 scientists. It also has an impressive global network of some 400 designers spread over twenty-five locations. Its shares are listed on six stock exchanges in nine countries and it is active in about 100 businesses, including lighting, monitors, shavers and colour picture tubes; each day its factories turn out a total 50 million integrated circuits. Royal Philips Electronics is managed by the Board of Management, which looks after the general direction and long-term strategy of the Philips group as a whole. The Supervisory Board monitors the general course of business of the Philips group as well as advising the Board of Management and supervising its policies. These policies are implemented by the Group Management Committee, which consists of the members of the Board of Management, chairmen of most of the product divisions and some other key officers. The Group Management Committee also serves to ensure that business issues and practices are shared across the various activities in the group. The company creed is “Let’s make things better’. It is committed to making better products and systems and contributing to improving the quality of people’s work and life. One recent example of this is its ‘genie’ mobile phone. To dial a number you just have to say it aloud. Its Web TV Internet terminal brings the excitement of cyberspace into the living room. And on travels around the world, whether passing the Eiffel Tower in Paris, walking across London’s Tower Bridge, or witnessing the beauty of the ancient pyramids of Giza, you don’t have to wonder any more who lit these world famous landmarks, it was Philips. Exercise 1. Read ‘The Philips Story’ again. Why are these dates important? Exercise 2. Read ‘The Philips Story’ again and find the figures that correspond to the following pieces of information. Exercise 3. Match the words from the article with the corresponding definitions. Exercise 4. In pairs, replace the words in italics with the words used in the article. 1. Gerard Philips set up (e stablished) a company in Eindhoven. 2. The company initially specialized in (c_ _ _ _ _ _ _ _ _ _ _ _ _) making carbon-filament lamps. 3. Developments in new lighting technologies fuelled a steady plan for growth (p _ _ _ _ _ _ _ _ of e _ _ _ _ _ _ _ _). 4. In 1983 it introduced (l _ _ _ _ _ _ _) the compact disk onto the market. 5. Each day its factories produce (t _ _ _ o_ _ _) a total of 50 million integrated circuits. 6. Royal Philips Electronics is run (m _ _ _ _ _ _) by the Board of Management. 7. The Supervisory Board carefully watches (m _ _ _ _ _ _ _) the general course of business. 8. Policies are put into practice (i _ _ _ _ _ _ _ _ _ _) by the Group Management Committee. 9. The Group Management Committee consists of members of the Board of Management and chairmen of most of the product sectors (d _ _ _ _ _ _ _ _). 10. The Group Management Committee serves to ensure that important matters (i _ _ _ _ _) and ways of doing business (p _ _ _ _ _ _ _ _) are shared across the company. Now check your answers with the article.